One of the goals of the Windows Live Wave 4 release was to improve interaction between Windows Live components. One of these improvements is the better integration of Windows Live Messenger into web services such as Hotmail. Windows users who open the Hotmail website in Microsoft's Internet Explorer will for instance notice that Windows Live Messenger is opened automatically. This can slow down the startup of Hotmail severely with some users reporting that Hotmail did not work at all. The integration of Windows Live Messenger, or previous messenger variants like MSN Messenger, is not a new phenomenon. The problem that Hotmail users face is the same, how to disable or remove Windows Live Messenger from starting with Hotmail. Messenger is only loaded in Internet Explorer if Hotmail is opened. Other web browsers are not loading the instant messenger. One easy option is therefor to use a different web browser to access Hotmail. But that's not always possible. The integration of Windows Live is handled by add-ons. Disabling those add-ons ensures that Messenger is not loaded on Hotmail startup. 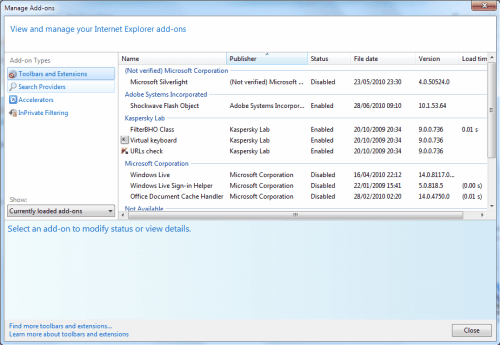 Open Internet Explorer and click on Tools > Manage Add-ons. A new window opens that displays a list of installed - but not necessarily enabled - add-ons. 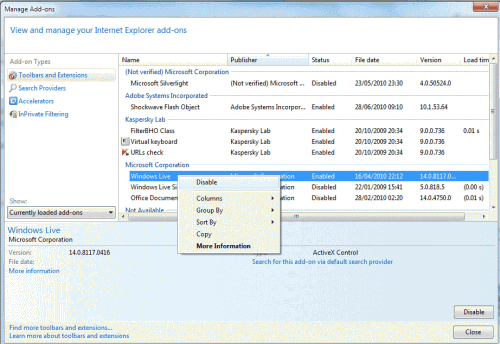 Locate the two add-ons Windows Live and Windows Live Sign-In Helper. Their status is enabled by default. To disable the two add-ons do the following. Left-click the add-on and select the Disable button in the lower right corner of the window. This disables the add-on in Internet Explorer. You can also right-click an add-on and select Disable and even select both at once and disable them together. Make sure the status reads disabled next to both Windows Live and Windows Live Sign-in Helper. Close the add-on manager. Hotmail will now open without loading Windows Live Messenger as well, this should speed up startup quite a bit, especially on slower computer systems. Any help on how disable Yahoo Messenger from slowing Yahoo mail? I use Firefox but it probably loading on other browsers too. BF, I do not use Yahoo Messenger but it is likely that it is either a plugin in Firefox that is causing the loading of Yahoo Messenger or a background software / service in Windows. Have you checked the plugins in Firefox? But what about those of us using XP and Firefox? I use Hotmail.co.uk and have never used, not ever want to use, any such messaging system. How do I prevent Live Messenger making my system insecure by automatically starting and logging in without asking me first?